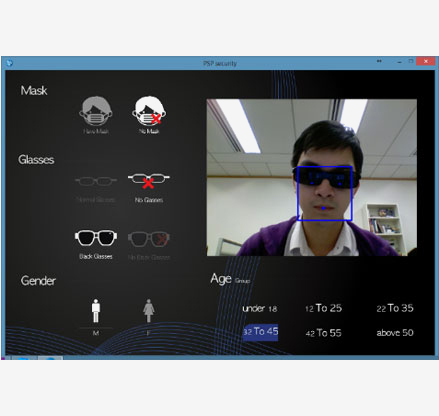 FX-Profile™ facial classification algorithm can effectively determine user facial profile, such as Gender, Age Group, Wearing of Glasses/Mask and Facial Expression, from images or videos. This helps system administrator, security officer, and marketer to understand more about user/customer profile. FX-Profile™ can run on computers, mobile devices, and embedded platform, for billboard, kiosk, vending machine, and digital signage applications. PSP Security is a leading developer of biometric security and intelligent video system and technology. We provide cost-effective solutions to governments, law enforcement, and businesses worldwide to enhance security, reduce identity theft and secure assets and intellectual properties. COPYRIGHT © 2019 PSP SECURITY CO LTD. ALL RIGHTS RESERVED.